With tears pouring out of their eyes, three restless children huddle together on the living room sofa while blurrily witnessing an inevitable fruition. Leaving a thickset trail of lifeless brown needles, the center of merriment was mercilessly dragged across the kitchen floor and deposited on a sunless sidewalk. That is one I can relate to! I appreciate that. Thank You so much. Looks like you had a long Christmas Ed! Thank You. I fabricated this scenario but I suppose some can relate. Aha; as it was your photo I assumed it to be your tree – which obviously had been on its base a long time. I took that photo walking to work one morning and my imagination took over. Thank You so very much. That’s always a sad time of year. I suppose so.. I fabricated this scenario but I think it rings true. You are so thoughtful. Thank You. I understand their sadness. I was very sad to see ours go this year. there wer hardly any needle. It was a GREAT tree. Very green and not shedding! I so appreciate that. Thank You. I had to snort (but in a good way!). Oh good! I hoped you’d take that as intended. Exactly Dennis! Thank You so much. This still makes me sad. I’m sorry, but Thank You. Aww, that’s a sad one! I really love the imagery, as always. I’m going to reblog this as a teaching opportunity. for kids who struggle with writing. Did you ever struggle with writing? Thank You so very much & yes, sometimes it can be a bit challenging. Blogs like this wonderful site, “My Two Sentences,” can offer teachers an opportunity to amaze reluctant /struggling 2e writers and also encourage them. Kids can “paint” their own sentences by adding colorful words (varied parts of speech). A five word sentence can be transformed into 20 words with a knowledge of parts of speech. These sentences may not be as rich in language and imagination as those of My Two Sentences, but who knows what gifts are lurking in the hands of our twice exceptional writers? Very kind of you. Thank You so much. So much melancholy in two sentences. perfect. Thank You so much Rhonda. So if you took the photo on the way to work, does that mean you didn’t have a real tree? This sadness is why i have an artificial tree. I just don’t want to say goodbye. I fabricated this scenario. I thought the idea was relatable. Thank You so much. let them burn 🙂 they will crackle and pop in sheer delight ! I suppose that’s true. Thank You so much. mine looks very similar to yours, except I launched off the balcony onto the snow 4 feet below. The wildlife is now using it as shelter. 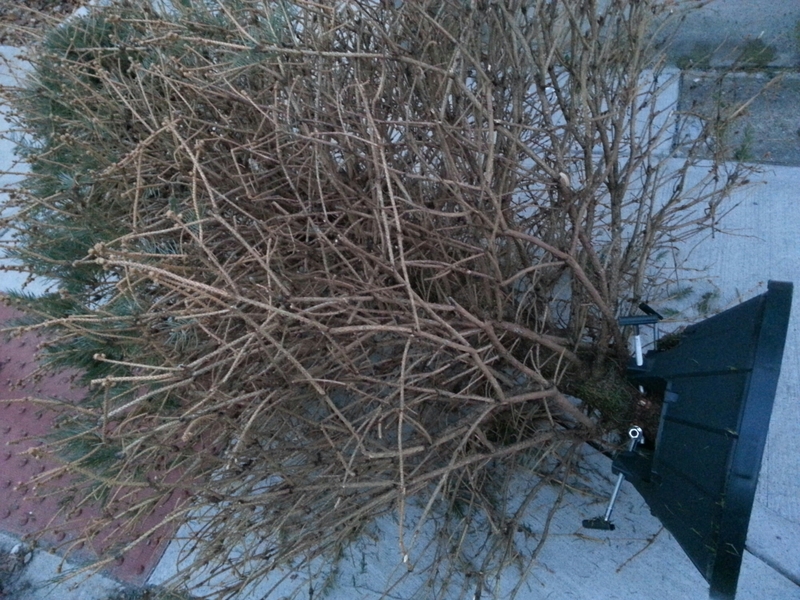 I miss my tree….until next year. Thank You so very much Lori. Thank You so very much for your wonderfully kind words M.Reed. I truly appreciate it. I am always impressed by your ability to say so much so eloquently in two sentences! Thank You so much Laurie for your wonderfully kind words. I appreciate it. I honestly appreciate your thoughtful comments. Thank You so much. Thanks for liking my poem. You have an excellent blog. Great writing & photos.